Private reserve just means that Rudy put his signature on one of the Koas that he thought was especially beautiful to try to create some kind of buzz about it. That's all. 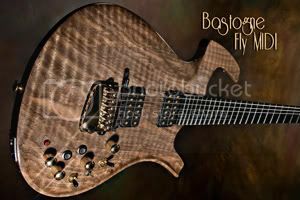 My Bastogne Fly has the gold hardware but I replaced the heavy gold metal knobs with Macassar Ebony knobs made by Jerome Little. They are much prettier and much lighter. The metal knobs added 4ozs in weight. This picture doesn't show the new ebony knobs as I haven't gotten around to shooting new pictures. Private reserve just means that Rudy put his signature on one of the Koas that he thought was especially beautiful to try to create some kind of buzz about it. The headstock has "Private Reserve" written on it, Rudy's signature likewise, and no edition series number, e.g. "2 of 25." So that, along with serial number where known, is how the specific instrument is identifiable, and that is the purpose of this thread. I just realized that you were responding to an earlier post. As to whether a Private Reserve instrument gets any special attention or other distinguishing features, I'm not arguing your point, but that is a topic for another thread. Did I already ask about a good head-on shot of the Bastogne for the Guide? Actually I was responding to PS's question, in THIS thread, about "what is meant by Private Reserve?" My point was that it was just a marketing thing to try and create some artificial value. "Did I already ask about a good head-on shot of the Bastogne for the Guide?" You did and when I can find the time to do it I'll send you a jpg. My interest is not so much about wanting to document the guitar as it is to create an image that shows it artistically but I do need to shoot the knobs for Jerome and I can do it then. I like the idea of what you're doing but the problem is the widely varying quality of the photography. It would be great if there was some way to have captured, professionally, an image of these guitars before they left the factory, in a matching and high quality way. It would make an amazing coffee table book. It would be great if there was some way to have captured, professionally, an image of these guitars before they left the factory, in a matching and high quality way. It would make an amazing coffee table book. That would be such a cool book! I guess it is a matter of how much it costs a company like USM to institute a more sophisticated record-keeping system. A mini photo booth and a digital camera wouldn't be much, but the staff involvement and shift to computer tracking could be significant. They really should move in that direction, though. Forget the coffee table book, so far they do not even keep records of Custom Shop orders: if you contact them for a replacement part by P-number of the guitar, that tells them nothing. 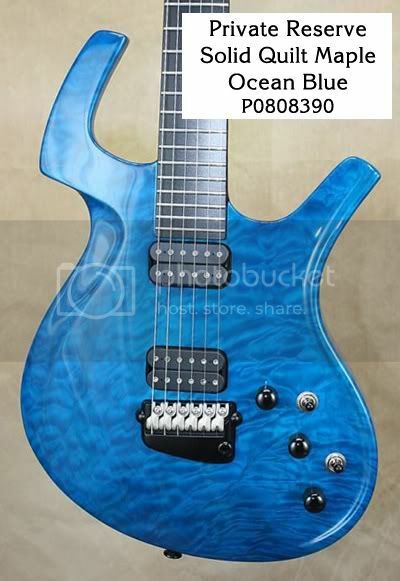 I tried to order a CS by saying, "Make one just like CS #Pnnnnnnn but in Majik..." and got nowhere even though the original guitar had been completed less than a month before! We had to re-spec the order from scratch. Full specs by serial number should be SOP for the entire output. Photo records of finished products would just plain be a real good idea. Hi-res, pro-quality photos would be something to shoot for. I want an Adrian Belew Cognac. What about you? But you have to play it Jeff Healey style, on lap, in order to enjoy it. Or in front of a mirror. How about the waves aligned horizontally, though, instead of vertically, so the audience can really set sail. Did this guitar get auctioned on eBay? Strandwolf: "Did this guitar get auctioned on eBay?" Yup, it was on eBay. For 8k, just like the red Quilt Maple Cognac limited. *drooool* @ Solid Quilt Maple Natural! Second only to the Ocean. Thanks for the pics and collecting/uploading them btw. About the nice LE summer Mojo Bubinga. Is this one similar to a Mojo flame, except that it is a bubinga top instead of maple? But still with the Mahogny body? At least that is what I would think, but articles on the internet aren`t always so clear. I have discussed this earlier, but I suppose this one would be similar to a normal Mojo when it comes to the sound?! Is this one similar to a Mojo flame, except that it is a bubinga top instead of maple?